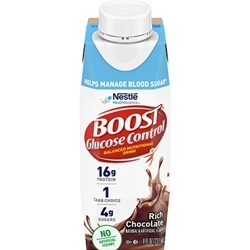 BOOST GLUCOSE CONTROL® is a balanced nutritional drink for people with diabetes. It provides a balance of protein, fat and carbohydrates designed to help manage blood sugar levels. 25 vitamins and minerals per 8 fl oz serving. Suitable as nutritious snack or mini meal and equivalent to only 1 Carb Choice.